Is the program almost out of money? I briefly considered participating in this, but I’m too cheap to spend more than $10k on a new car. Seeing news on how popular this program is got me thinking about unintended consequences, though. Conventional wisdom says that the most economical car is the one sitting in your driveway. How many folks out there just took on a car payment that they can’t really afford? The MPG improvement with the new car is likely canceled out by the environmental cost of the energy and raw materials used to create the new car. Wouldn’t it be nice if people would use their down payment to maintain their existing car and plow the would-be car payment into the stock market as a contingency fund or for a future all-cash car purchase in a few years? In Q1 2008 I saved all of our pre-approved credit card offers to see how many we received and who were the worst offenders. I had previously opted out of offers at optoutprescreen.com, so I received quite a bit less than Stephanie. After Q1, I also had Stephanie opt out to see if it would have any effect. It seems like the opt out was very successful, dropping our offers from 30 down to 13, 12 of which were for Stephanie. The majority of these came during April, probably prior to the opt out taking full effect. I’m very curious to see how many we get for Q3 (although she did already receive one in the first couple of days of July). Q1 2008 Credit Card Offers, originally uploaded by jcarter. My wife and I get a ton of credit card offers in the mail. Starting in January 2008, I decided to save the letters to see how many we receive in one year. I’m also curious if we’re able to reduce the number of offers we receive by opting out. 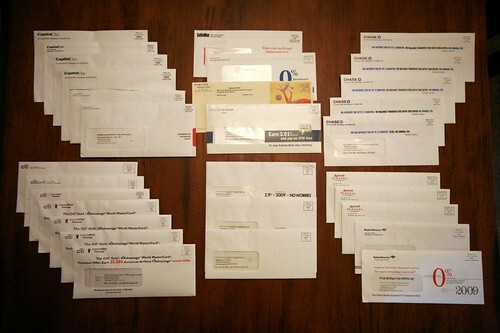 The picture above shows offers received from January 1 to March 31. There are a total of 30 letters; my wife received 23 and I received seven. This seems to indicate that my previous opt-out efforts have paid off. I was surprised by how many repeats we received; seven from Citibank/AA, six from Capital One, five from Chase, three from Marriott, and three from Discover. It was the annoyance of seeing the same Chase envelope every week that started me on this project. Our next step in the process is to see if we can reduce my wife’s letter count by opting-out here and also with the individual repeat offenders.